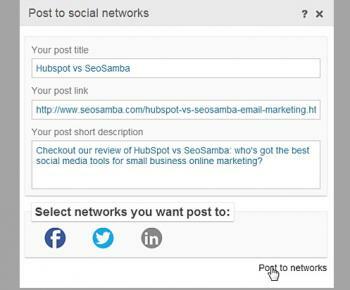 Hubspot vs SeoSamba: who has the best social media tools? HubSpot integrates marketing analytics, CRM and social media tools to allow for interaction with social networks and analytics. 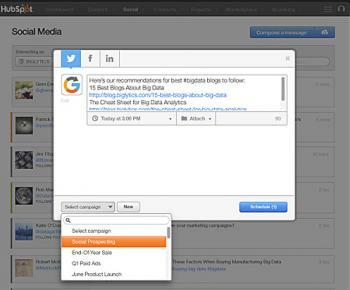 HubSpot has provided a major overhaul with Social Inbox, an all-in-one social media suite within the HubSpot software. Social Inbox works online with HubSpot Contacts databases to provide in-depth information about social profiles and user tracking, with an elegant interface to publish social posts from templates. With the addition of internal search engine, Chrome Extension, and mobile app for round-the-clock social monitoring, Social Inbox is so user friendly that's it's a pitty it isn't available as a standalone social media tool. SeoSamba provides native social media tools for multi-channel broadcasting blog posts, news and PRs across any number of websites. SeoToaster inline CMS offers free, quick and efficient social network broadcast tools to send post across social channels, right from your website. SeoSamba relies on integrated analytics, just like Google Analytics and other professional software, to provide in-depth insight regarding all social activities. SeoSamba's online marketing platform allows for multi-sites broadcasting across social channels including Facebook, Twitter, LinkedIn, Google+. All social media tools are integrated with the blog, news & pr platform for one-click multichannel publishing. HubSpot's all-in-one Social Inbox provides solid tools for in-depth management of social channels. 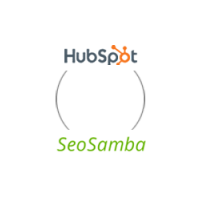 SeoSamba provides the same core features with added e-commerce and multi-sites possibilities. While larger and competitive sites will logically require a tighter custom integration, faster and cheaper in an open source environment like SeoSamba's, Hubspot did a good job in social media integration and will fit the bill for most one-man operations and small businesses. Social networks not enough to drive sales?